In his introduction to Dignity. A History the editor, Remy Debes, explains that the aim of the book is "to deliver the first dedicated conceptual history of dignity in its moralized sense". (p. 4). This is an extremely ambitious promise, which I unfortunately do not believe the anthology actually fulfils. In fact, the proposed project is so ambitious that it is unclear whether any one book, be it a monograph or a collection of papers, could ever fully deliver on the editor's promissory note. One problem is the timescale, which the anthology attempts to cover. Most contemporary historical accounts of dignity take Kant, or one of his immediate predecessors, as their starting point, and then provide a brief, preliminary sketch of how the concept was used before that time (see e.g. Rosen 2012). Dignity. A History adopts a chronological approach, which goes back much, much further than this. The first chapter, by Patrice Rankine, discusses "Dignity in Homer and Classical Greece". The second chapter, by Miriam Griffin, explores "Dignity in Roman and Stoic Thought". The third chapter, by Bonnie Kent, provides a revisionary interpretation of the early Christian Imago Dei approach to human dignity. And so on, and so forth all the way to the 20 century. The last three contributions in the anthology, thus all deal with various 20th century discussions on or involving dignity. Marcus Duwell reflects upon "Why Bioethics Isn't Ready for Human Dignity". Bernard Boxill provides a fascinating glimpse of the role played by dignity in early 20th century Africana philosophy, more specifically in the writings of Du Bois. And Emma Kaufman concludes the volume with her reflections on "Death and dignity in American Law", which explores the role of dignity in the debate on the death penalty in American jurisprudence in the latter half of the 20th century. The conceptual history presented in the anthology thus covers a period, which stretches back almost 3000 years. Dignity. A History includes 17 contributions from 17 different contributors, but even this leaves gaps and holes in the presentation of the conceptual development of dignity. In his somewhat idiosyncratic review of Dignity. A History on Notre Dame Philosophical Reviews Y. Michael Barilan thus singles out the omission of any discussion of Judaism as "very odd" (Barilan 2018), but this is hardly the only noteworthy oversight. Another problem is the anthology's (laudable) globalist aspirations. Dignity. A History does not simply present a traditional Eurocentric exploration of the philosophical history of dignity. It also includes a short (six pages) reflection by David Wong on "Dignity in Confucian and Buddhist Thought", and a long (28 pages) chapter by Mustafa Shah on "Islamic Conceptions of Dignity: Historical Trajectories and Paradigms". These contributions offers interesting, alternative perspectives on and approaches to the understanding, importance and relevance of the concept of dignity. They also, quite naturally, appear somewhat less well integrated in the overall project than most of the other contributions, which all implicitly relies on and belong to one, broadly conceived, European historical and cultural tradition. This raises the question of whether more should have been done to actively include non-European traditions and insights, or whether, on the other hand, the moralized concept of dignity is distinctly Christian-European invention? A third problem is the anthology's (once again laudable) ambition to provide a look at dignity from "across a range of disciplines" (quotation from the back cover text). Most of the contributors are philosophers, and although they do occasionally engage with other disciplines, most of the contributions simply fail to deliver on this promise. One exception is Edward Town's reflection on "Portraiture, Social Positioning, and Displays of Dignity in Early Modern London", which provides insight into the understanding of dignity in England in the latter half of the 16th century through analyses of two paintings by the Flemish painter Marcus Gheeraerts the Elder. Another is Brian Copenhaver's chapter on "Dignity, Vile Bodies, and Nakedness: Giovanni Pico and Gianozzo Manetti", which draws upon a broad spectrum of both literature and art in his exploration of the concept dignity in Cicero, early Christianity and the renaissance. Taken on their own each of these three problems would make it difficult to provide a conceptual history of dignity, which was both comprehensive and systematic. Taken together they make such a project virtually impossible. Dignity. A History thus fails to accomplish the explicit aim it sets itself. Delivering a global, 3000 year, cross-disciplinary conceptual history of dignity is simply too ambitious a goal for any one book to ever accomplish. The anthology raises two further problems, or perhaps complications, which is worth mentioning, both of which concerns the conceptual background assumptions which the editor, and subsequently many of the contributors, uses to structure both the anthology and their individual contributions. At the most basic level the conception of dignity, which Dignity. A History seeks to illuminate is dignity as (the basis of) fundamental equal moral worth or status, which every human being supposedly possess irrespective of their social rank, economic status or political views. This particular notion of dignity, which Debes introduces in the very first paragraphs in his introduction (p. 1), is explicitly adopted and discussed in almost all the contributions to the anthology. However, as Debes also notes in the introduction, this moralized conception of dignity is a relatively new idea in the sense that it is only within the last 200 years that it has gained widespread acceptance among both philosophers and the wider public. (p. 1-2). One of the defining moments in the development of this view of dignity, perhaps the single most important philosophical contribution to the conceptual history of the term, is Kant's Groundwork of the Metaphysics of Morals from 1785. Kant here famously declared that persons must never be treated merely as means, but also always as ends in themselves, because persons do not have a price, but only Würde, a term that is often translated as "dignity" (p. 3. See also Kant 1996, 4:428-29 and 4:434-35). If one accepts this account then it immediately raises serious problems for all attempts to locate and discuss pre-Kantian moralized conceptions of dignity. If dignity as unconditional equal moral worth really is a distinctively modern idea, then it obviously becomes problematic, perhaps even anachronistic, to appeal to this idea when analyzing and discussing pre-modern texts and thinkers. It is thus hardly surprising that many of the contributions to Dignity. A History, which deal with the pre-modern and pre-Kantian period have to use indirect and circuitous means in order to get the moralized conception of dignity clearly into view. Another problem arises if the brief account of Kant's influence sketched above does not hold up. Oliver Sensen has thus recently challenged the widely accepted idea that Kant's conception of dignity is as revolutionary as it is often presented. Sensen's basic argument is that Kant did not actually share the modern understanding of dignity as unconditional, equal moral worth, but was more in line with the older conception of dignity as a sort of elevated standing with respect to someone or something else. (Sensen 2011). If Sensen is right then many of the specific discussions in the contributions to the anthology, as well as many of the introductory remarks provided by Remy Debes, are somewhat misleading, perhaps even misguided. Many of the individual contributors thus explicitly appeal to Kant, either to explain the moralized conception of dignity, or to contrast the specific historical understanding of dignity, which they are analyzing, with Kant's account. Sensen's re-interpretation of Kant puts these discussions in a new light, and seems to undermine at least some of the many claims made on behalf of Kant in the anthology. This problem is particularly pressing because Sensen actually contributes to the volume with a chapter in which he presents and defends his revisionary account of Kant's conception of dignity. This means that one of the central contributions to the anthology actively challenges the basic framework that structure and define most of the rest of the anthology. Reading all of the essays in Dignity. A History in one or two sittings, as I did, can thus be a somewhat schizophrenic experience. This of course does not mean that the anthology is without its merits. Many of the particular essays are worth reading simply for the specific arguments they present and the way they extend and elaborate on previous work by the relevant contributors. I have already mentioned several chapters, which I find both illuminating and informative. Other interesting contributions include Stephen Darwall's chapter on "Equal Dignity and Rights", which expands upon and further elaborates Darwall's previous work on dignity and early modern moral philosophy and Christine Henderson's "On Bourgeois Dignity. Making the Self-Made Man", which provides a fascinating discussion of the conceptual shifts in the meaning of dignity among the bourgeois in England post-1688. Finally Oliver Sensen's "Dignity: Kant's revolutionary conception", is an accessible and clearly argued presentation of Sensen's revisionary re-interpretation of Kant's influential conception of dignity, which I discussed above. To sum up: Dignity. A History fails in its ambition to be a comprehensive and systematic account of the conceptual history of the modern, moralized conception of dignity. The anthology is also beset by certain structural flaws and problems, which weaken the book's overall coherence and consistency. However, the individual essays are often both interesting and informative, and are worth looking up if you have an interest in a particular period in the conceptual history of dignity. Even if the book does not live up to its intended aim, there is still a lot one can learn from it. Rosen, M. (2012). 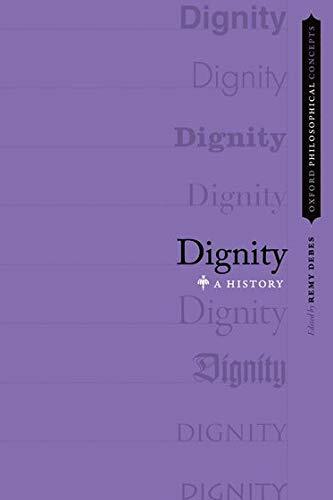 Dignity: Its History and Meaning Cambridge, MA: Harvard University Press. Sensen, O. (2011). Kant on Human Dignity. Berlin: De Gruyter.